In a recent post I discussed the emerging use of mobile phones and the ubiquitous nature of the technology. Just about every student has a mobile phone in the secondary school here in Dhaka and they bring it to school. The obvious security advantage is the ability to make contact outside the school in a time of emergency or upset and given the political climate here we all see this as a positive. Apart from this the technology is not being used for educational purposes [yet] and in fact students are being told not to use them during school hours or activities. I cited the typical tug-of-war at a school athletic day as real-life example of a student finding it natural to want to video the event using his mobile phone. In response to this post, Graham Wegner, commented as the devils advocate and said, "Did Student B have permission from those involved in the tug-of-war to do the videoing? How much say did the students who would appear in the video footage have in the matter? Where would the video footage end up? Would anyone's rights to privacy be trampled on by this act?" and "....I think there is a huge teachable moment for your students afterwards in terms of where the line is drawn between a person's right to capture video footage of a school event and the rights of those to control their own identity and who may not want to be part of that footage." In response to Graham's excellent observation that I was focussed on using the technology and not giving obvious consideration to the 'digital citizen' ramifications I took the issue to my ITGS Grade 11 class last week. I asked them first to read our draft Mobile Phone Policy and also our Handheld Users Agreement document. Naimul: "I believe that if the mobile footage is being used to be put in an website then it is a different matter. i feel than it is okay to put up video footage of other people with out their permission as long as their is nothing offensive in the video, we should not let technology make us so vonurable, if this becomes a normal habit for people then technology will become very limited in term of usage. it might be an issue if the person recording the video zoomed in to certain individual but if the video footage shows everyone competting in an event the there should not be any regulations against it. we should not be shamed for who we are so i would say it was okay for that student to video the tug of war." Shakila: "I think it would also be fair to ask the person who is to be videoed. There is also another issue that if there are a group of people, one cannot ask permission from each and every person.......There should always be a line drawn, because the ones who are willing to put things up online or make something public should ask him/herself in the victims position. Mobile phones are very effective tools, so it would be wise not to misuse them." Salma: "I read the Mobile phone users policy draft but i dont think mobiles should be allowed in school because like instant messaging softwares, mobiles can easily distract a student. They can use their mobile phones to socialize with other students or with outsiders. The question is if they had a mobile phone, where would they be using it without permission from the teachers-the school bathrooms, an empty classroom, inside school premises." and "Students will be using this technology to upset other students which makes these stduents victims to mobile bullying.There have been delicate cases around the world where many people have been upset and hurt emotionally. We should ban the use of mobile phones." Omar: "As far as the Mobile Policy goes, it depends on the school flexibility, whether it treats its students as responsible, trustworthy students or not. In addition, I believe that the policies made by school should be mature as many of the statements seem very childish, as it direct us by saying what can be done and what cannot be done." Atif: "I think that mobile phones should be treated as an incentive for students for learning. Teachers should not think that they are only for calling people. Nowadays cellphones are commonly used as camera's, music players, receiving podcasts, browsing the internet. They are just tools as long they are used properly. I think that cellphones should be allowed in their own risks. If they get stolen then it should be the students responsibilty and not the schools. Phones can also be used for certain activities or as as a tool for timing experiments. " Salvi: "I believe that it was fine for the student to video the tug of war. First of all the student took the permisson of a teacher before videoing it. 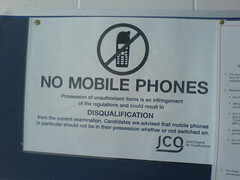 In the mobile phone policy, it clearly states that students are allowed to use their mobile phone in lesson times at the discression of the teacher. In this case, it was not even lesson time and the student did take the permission of the teacher before videoing it. Also, it is okay to video other people unless their is nothing offensive in it which would disturb the privacy of the people in it. And even if the video ends up at a web page or somewhere else, it will not really matter, as there is nothing offensive in the video. It is only a game played by a lot of students and also the video was not recorded based on a particular person. So it is okay." Sabbab: "It is very pleasing to see the use of mobile phone technology in use at our school. it might be true that some of us here at ISD feel that the privacy is being violated, but in this very case i think the student was not wrong in photographing the sport event as he seeked a teacher's permission and he was allowed to do so. this complies with the ISD Mobile policy. I think that before any events at school we should have the consent of all the students reagarding photography or video issue." I was pleasantly surprised at the different balanced opinions that came through in this online discussion. It seems that the general feeling is that mobile phones are OK to be used during school, especially with the permission of a teacher and that although they can be a distraction, there are some valid educational uses for them. In terms of taking images and video the feeling seems to be that if permission is granted (putting the onus on the teacher?) then it is OK, and also if it is a large crowd and not selecting an individual for some reason this is very much alright. There is a feeling of 'what is all this fuss about' in some comments but there is also shown an awareness of what can happen if information about someone is put online without permission. Thanks Graham for your push to look at this in more depth as it truly did provide an excellent 'teachable moment' in my class. Our school mobile phone policy (draft) has a long way to go before we gain consensus and I am be interested if any readers of this blog have a mobile policy they can share. I've referred to this in our own blog ( http://nswlearnscope.com ) as a result of Graham Wegners - http://gwegner.edublogs.org link to me ! Lovely writing style and great information. Well, the product is very cheap in Actfind.com, anybody know Actfind.com is a believable or not? Even the kinder garden kids have mobile phones nowadays. Most of them of course come from China mobile phone manufucturers.